Hi readers! 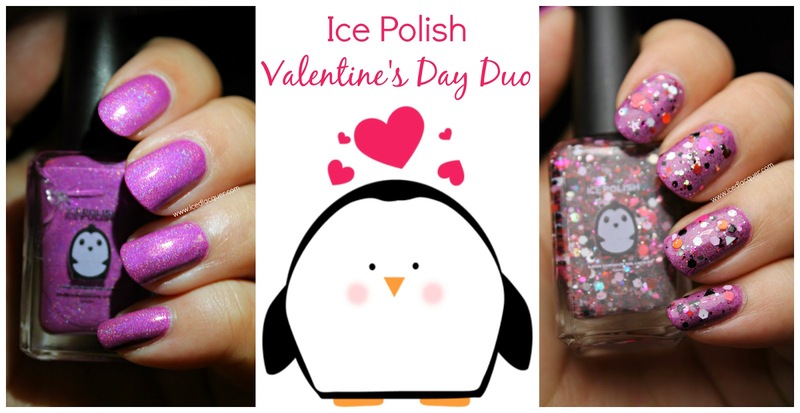 Today I have a Valentine's Day duo from Ice Polish to share with you. Not only is this duo gorgeous, but I feel like it was made just for me! Both the colors and the names are just hilariously perfect and amazing. You might also notice that Ice Polish has a new look! Erin recently made the switch to these beautiful square bottles with new labels featuring her little Ice Polish penguin mascot. So cute, right?! Ok, let's get to the swatches. "Do Ya Love Me?" - A bright orchid holographic with pink glass flecks. This one had great coverage and my photos show three coats plus top coat. You could easily do two thicker coats. This dried to a matte finish. 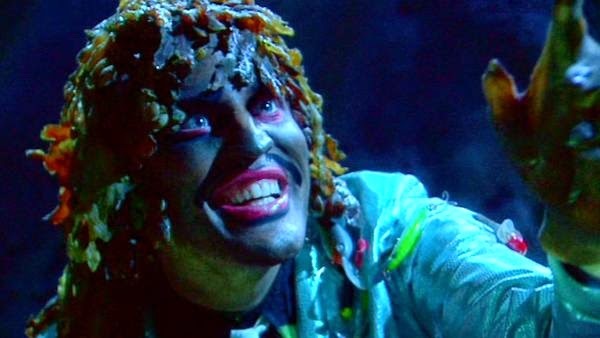 Erin says this one was inspired by the episode of The Mighty Boosh with Old Gregg (pictured above)! If you like weird shows and British humor, this show is a must! As soon as I saw the label I got the "Do ya love me?" song stuck in my head! This photo was taken with my camera flash to bring out the beautiful holo sparkle. "Shot Through The Heart" - A clear based glitter topper filled with pink, red, white, black, and silver holo glitters, red holo and pink neon hearts, black and white triangles, small white stars, and a little bit of holographic sparkle. The glitter mix in this one is awesome and my photos show one coat on top of "Do Ya Love Me?" plus top coat. No fishing required for any of the larger shapes! This polish was also inspired by another one of my favorite songs! Seriously, it's like Erin is a mind reader! 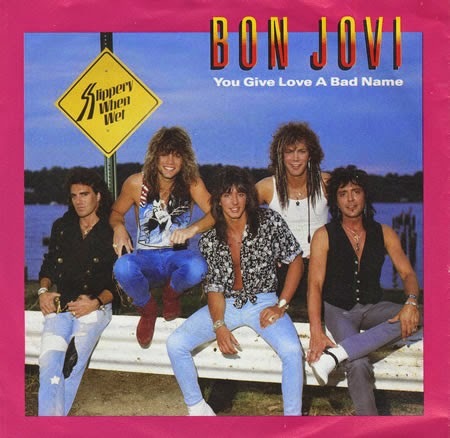 Love me some Bon Jovi. Color names: "Do Ya Love Me?" & "Shot Through The Heart"
My opinion: Just last week I was wishing for a "radiant orchid" holo and this one is gorgeous! Between the awesome color combination, formulas, and names this collection has absolutely won my heart. I love that Erin uses such a wide variety of shapes and size of glitters in her mixes like this. I also wanted to quickly mention that I've got a small crack in my bottle of "Do Ya Love Me?" which I'm certain happened in transit. All of my polishes were wrapped up all cozy and protected, but I know crazy things can happen with mail carriers. Erin was happy to send me another bottle, but I told her this one is just fine for me. I'm impressed that the bottle didn't crack all the way through! Should you ever have any issue like this Erin has awesome customer service! Long time no see! I'm in the process of writing up a little post to let you guys know what I've been up to lately, but for today let's take a look and six shades from the KBShimmer Birthstone Collection! Hey! Long time no see! At the end of September I got a new job that has kept me hella busy, but not so busy that I couldn't sit down on my day off and do some new collection swatching. Today it's some shades from the brand new KBShimmer Winter 2015 collection. Lucky 13 Lacquer "Abnormally Attracted to Danger"
Hey-o! Super simple swatch post for you today. I've been so overwhelmed with life and unnecessary drama lately that blogging has kind of been pushed to the back burner... but then I look at the pile of gorgeous untried polishes I have and feel guilty. Sooo here's my attempt to give them some love!